Make your summer one of the most memorable yet by entering Stauffer's Cookies Myrtle Beach Sweepstakes for a chance to win a FREE trip for 4 to Myrtle Beach, South Carolina! 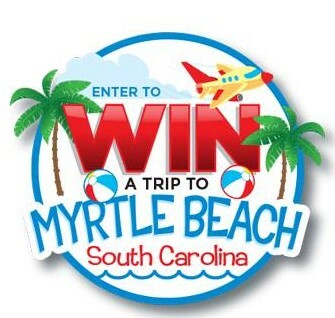 Three Grand Prizes: A trip package to Myrtle Beach, SC for up to four (4) persons. Each Grand Prize package consists exclusively of: roundtrip (“R/T”) coach air transportation for Grand Prize winner and up to three (3) travel companions between major gateway airport nearest winner’s residence and Myrtle Beach, SC; three (3) consecutive night hotel room accommodations (quad occupancy suite); $100 Visa Gift Card. Approximate retail value of each Grand Prize is: $4,500. Ten (10) First Prizes: Each First Prize is one (1) Pawleys Island Rope Hammock. ARV of each First Prize is $169.99. One-Hundred (100) Second Prizes: Each Second Prize is one (1) Myrtle Beach Beach Towel. Approximate retail value of each Second Prize is $12.00. Ninety (90) Third Prizes: Each Second Prize is a Tervis 2-Tumbler Tumbler Set. Approximate retail value of each Third Prize is $31.00. HINT: Codes to enter can be found on participating products, but you can get codes to enter for FREE via postal mail. See the rules for details. This Sweepstakes ends on 08/15/16 and you can ENTER DAILY to win.